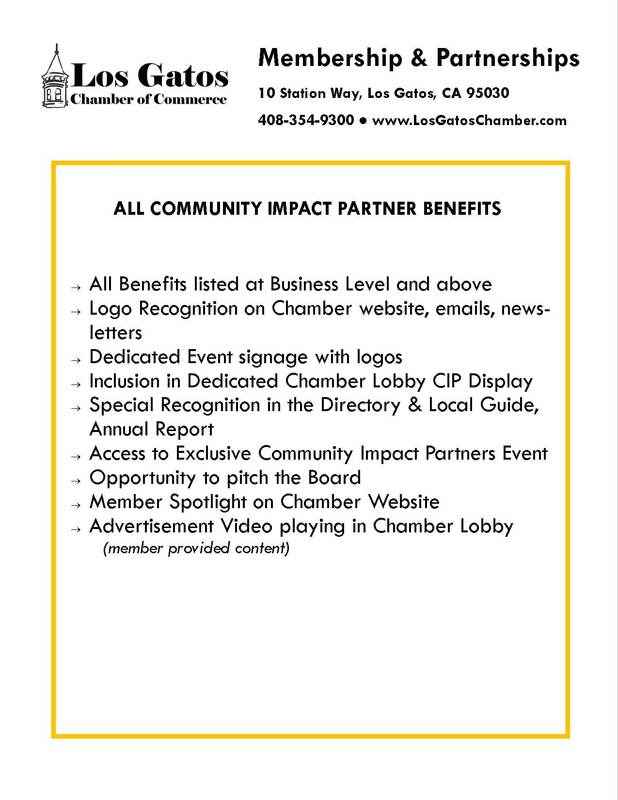 The Los Gatos Chamber of Commerce Community Impact Partners are an exclusive business group that is committed to the economic vitality of our community. The continued support of our Community Impact Partner members has been instrumental in the growth of the Chamber. In recognition of this contribution, the Chamber provides Community Impact Partner members with heightened visibility and unique promotional opportunities throughout the year. Members include retailers, restaurants, hotels, professionals, service businesses, property owners, civic organizations, and members of our community. The common thread among our members is that they care about the vitality and success of business – specifically business in Los Gatos. The Los Gatos Chamber of Commerce is your connection to all of this and more. Promotion Outreach & Visibility. Every day the Los Gatos Chamber of Commerce receives inquiries from customers looking for referrals. Also, we have numerous walk-ins to Los Gatos’ Visitors Center looking for information about our local businesses on a daily basis. Many of these visitors are local residents! Who do we refer them to? Chamber members. Our website, open 24/7, provides up-to-date information about our member businesses, giving them visibility and accessibility to over 2,000 unique visitors every month any time of day or night. Members have the opportunity of enhancing their listings on the website. Each member has at least two entries in the annually published Directory & Local Guide, with a distribution of 17,000 copies, including local residents. 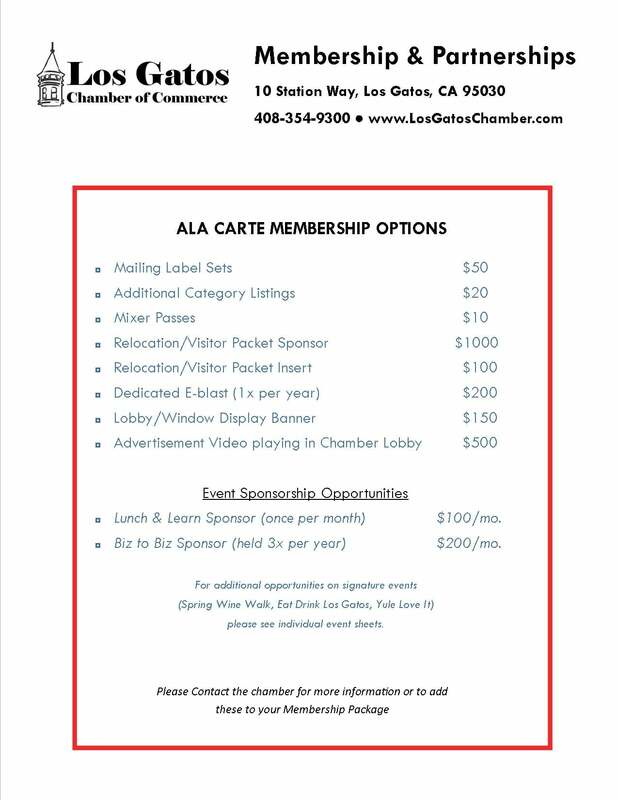 Every member can display business cards and information in the Chamber office and at our Biz to Biz Luncheons. These benefits are for Chamber members only. Business Advocacy. 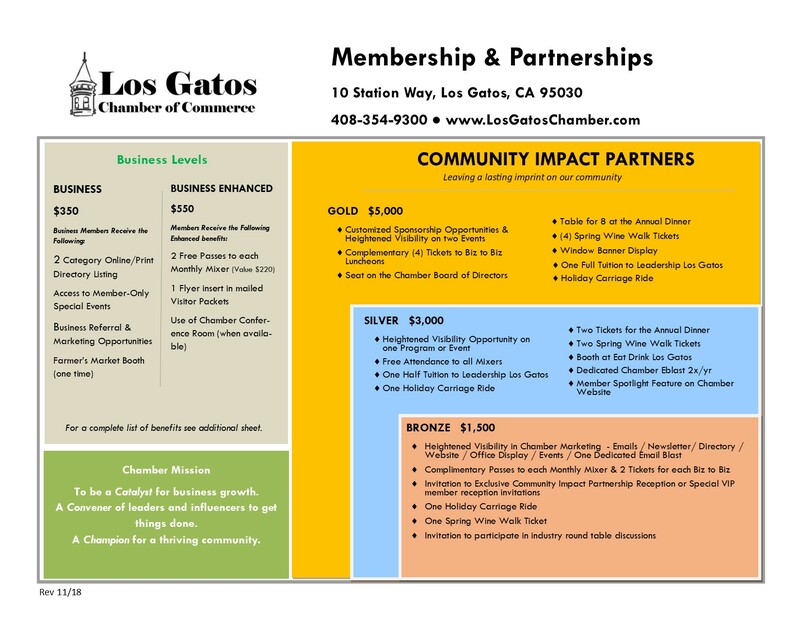 The Los Gatos Chamber of Commerce works with the Town of Los Gatos and represents the interests of our local businesses at regular meetings with the Town Manager and Mayor. The Chamber collaborates with local officials to seek information on programs and projects that might impact business. Community. The Los Gatos Chamber of Commerce is a sponsor or facilitator of many community events such as the Holiday Carriage Rides, Wine Walks, Business Person and Business of the Year, and Leadership Los Gatos—an eight month program done in conjunction with the Town of Los Gatos to promote participation and a greater understanding of the workings of our Town and its part in the larger community. 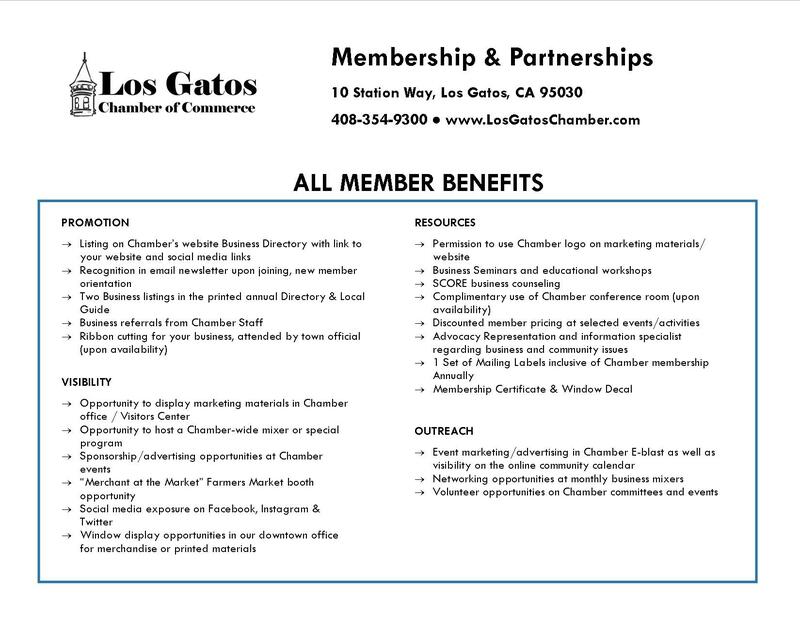 By joining the Los Gatos Chamber of Commerce, your business becomes associated with these special events and programs. Your business can receive special recognition for sponsoring our Chamber events. In addition, the Chamber can host a ribbon cutting for your business that will be attended by an elected Town official. These ribbon cuttings are available for new businesses, when changing a location, or celebrating a significant anniversary. The event will be recognized on the Chamber website, weekly e-newsletter that reaches over 3,000 subscribers. Networking & Referrals. Get to know other Los Gatos Chamber of Commerce members, community leaders and Town Staff at our networking events. Our monthly networking mixers draw an average of 50-100 people. Our Biz-to-Biz networking educational luncheons have attendance of 60 guests on average. At any and all of these events, you have the opportunity of meeting prospective clients or customers.